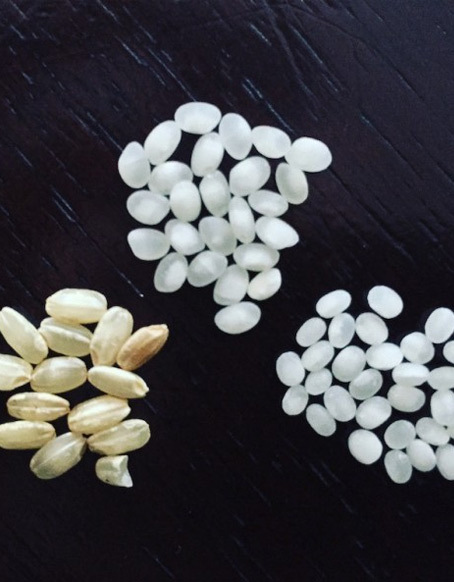 Premium Sake Grades are determined largely by rice polishing ratio (Seimai Buai). There are two main categories too – A grade which had Brewer’s alcohol added and the other which did not have Brewer’s alcohol added. Those points are explained below. The rice that is used to brew sake is normally polished in order to get rid of some unnecessary components in the outer and middle layers. It is the pure starch in the middle that is most wanted for sake brewing. Rice polishing is done with special machine about 30m tall. It is polished by the grinder inside and it takes about 50 hours to polish 50% of rice. Under the sake brewing law in Japan, the rice has a minimum polishing ratio, according to its grade. In general, the bigger the proportion of its original size being polished away, the better the grade/quality of sake. This leads to a finer and purer taste in the resulting sake. Polishing ratios can range from no minimum to 50% of its original size being polished away. Premium sake is preservative/flavouring free – it is not permitted to add any preservatives or flavouring to premium sake by Japanese law. Only possible additive to the premium sake is brewer’s alcohol. Brewer’s Alcohol can be made either from starch-based agricultural products or sugar cane. The amount of Brewer’s Alcohol that can be added is restricted to less than 10% of the total weight of the rice being used to brew the sake. Premium sake can either be brewer’s alcohol added or non-added. Addition of alcohol is done not to increase its volume or level of alcohol, but to achieve a certain style of sake; in particular, to make a more fragrant style on the nose and lighter on the palate. Sake without addition of brewer’s alcohol is called Junmai, meaning Pure Rice Sake. Hence, sake with addition of brewer’s alcohol is called Non-Junmai. Junmai as a category tends to be fuller and richer in style with higher acidity, whereas Non-Junmai tends to be leaner and drier, with only moderate acidity. Here is the sake diagram to show different sake grades with relevant rice polishing ratios and different styles. On the right hand side of the diagram, there are three premium grades of Junmai (Pure Rice Sake where no brewer’s alcohol been added), and non-Junmai (Brewer’s alcohol has been added to the sake) on the left hand side. The lower the position of grade on the triangle, less its minimum rice polishing ratio would be. The most basic grades for Junmai or Non-Junmai are Junmai and Honjozo, with 100% and 70% minimum polishing ratios respectively. 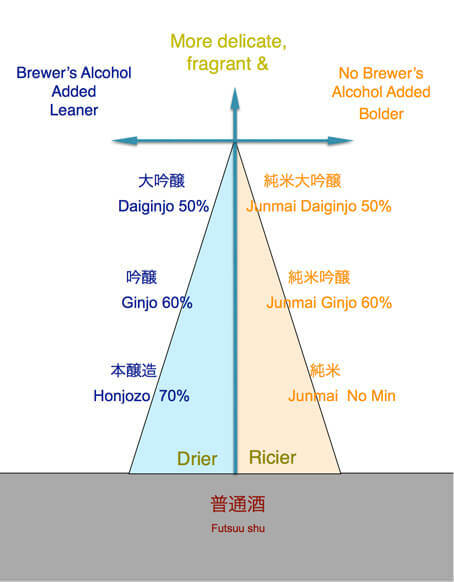 Then Junmai Ginjo and Ginjo have minimum 60% and Junmai Daiginjo and Daiginjo have minimum 50% rice polishing ratio. Higher the rice being polished, more elegant, delicate, fragrant and pure the sake gets. It is not on the diagram, but there are “Tokubetsu” categories, where the sake is called “Tokubetsu Honjozo” or “Tokubetsu Junmai” when rice have been polished to Ginjo or Junmai Ginjo standards of minimum 60%. In order for any sake to be labelled with the term “Tokubetsu”, it has to be made with a special method, for example, Kimoto or Yamahai, or has to be made with special strain of yeasts. As the most basic sake, there is Futsu-shu. Futsu-shu is not included in the premium category. Futsu-shu means “ordinary alcohol” in English and it accounts for about 70% of total sake production in the entire world. There is no minimum polishing ratio for Futsu-shu making. Junmai tends to have bolder style with higher acidity, umami and more ricey character, whereas non-Junmai tends to have leaner body with more prominent ginjo aroma with lower acidity and umami.